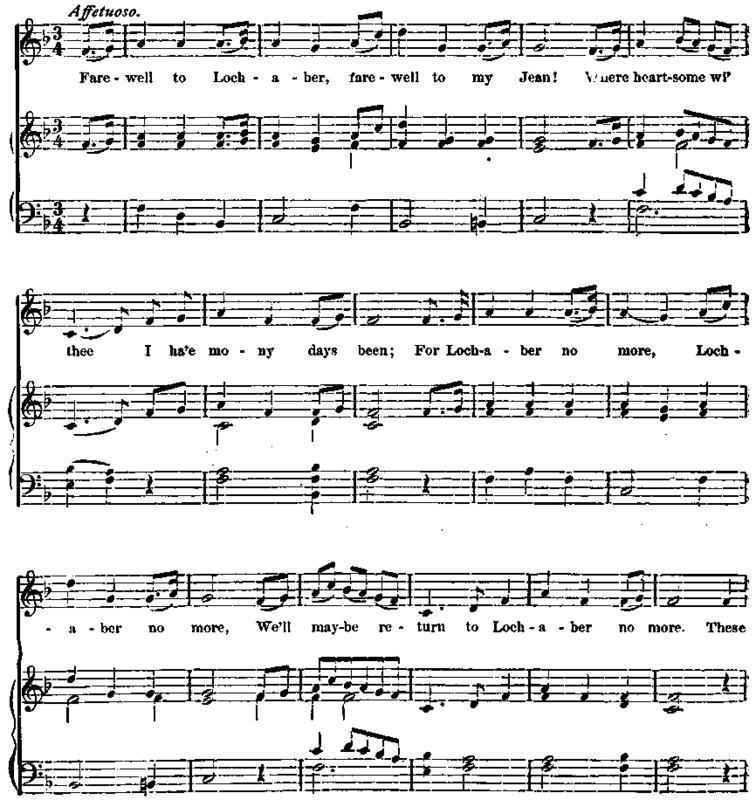 Tune," when there is evidence that Irish music was in favor at the court j King James, went to Ireland with the strongest reason for wishing to excite Irish sympathy. How natural that the royal progress should be made to the sound of Irish airs. Singularly enough, the air can be traced in its journey into Scotland from its native land. Bunting,, in his "Ancient Music of Ireland," without knowing of the since-discovered fact about " The Irish Tune," says: " Another eminent harper of this period was Myles Eeilly, ot Killincarra, in the county of Cavan, born about 1635. He was universally referred to as the composer of the original ' Lochaber.' The air is supposed to have been carried into. Scotland by Thomas Connallon, born five years later, at Cloonmahoon, in the county of Sligo. O'Neill calls him ' the great harper/ and says he attained city honors in Edinburgh, where he died." The song first appeared in its present form in Ramsay's Tea-Table Miscellany,"" 1724. The melody is said to have so powerful an effect upon the Highlander in a foreign army, in a strange land, that military bands are forbidden to play it.